This letter is being sent in strong protest of your city's plan -- and all of Japan's plan -- to incinerate radioactive waste created by the nuclear disaster at the Fukushima-Daiichi power plant/waste dump. Radioactive poisons have a linear, no lower threshold dose response according to the latest scientific studies, as well as the majority of studies for the last hundred years or so. Most of the human data is from Hiroshima and Nagasaki bomb studies, even 25 years after Chernobyl, but the effects of various carefully controlled doses on tens of millions of animals, of hundreds of species has also been observed, in tens of thousands of studies conducted by tens of thousands of researchers. From its onset, the nuclear industry made a promise to the public: Near-perfect isolation of their radioactive effluent from the environment for as long as necessary. The promise has never been kept very well, but Fukushima literally blew the lid off the subject completely. If you now burn the debris, radioactive particles which currently are isolated from humanity in the debris pile will be re-released into the environment. Some of these "radioactive elements will have very long half-lives, such as cesium-135 and Iodine-129. Some will have shorter half-lives, such as cesium-137 and strontium-90, both around 30 years. Additionally, plutonium, perhaps the deadliest substance on earth, will be re-released. It's better to keep these awful reactor by-products of Fukushima's failures, these death-ray emitting radionuclides from the hell inside the reactor cores, well away from humans. So please don't burn the waste! It must all be stored -- for thousands of years. Reducing it to ashes and dumping the ashes in the sea is NOT a proper solution: It is exactly the opposite of what should be done, and doesn't in any way keep the nuclear industry's promise to the public. 99.99999% containment (or better) was promised. Energy "too cheap to meter" was promised. Advanced reactor designs were promised. Proper maintenance of the currently-operating reactors was also promised. None of this has been delivered. None of it ever will be. Right now our local pair of nuclear reactors, San Onofre, is shut down because the replacement steam generators we purchased from Mitsubishi Heavy Industries, at a cost of approximately 1.4 billion USD, have turned out to be of sub-standard quality. Much of the blame lies with the owners of San Onofre, who "carefully" inspected these steam generators when they arrived, and found plenty to fix, and told the public they had fixed them properly and the steam generators would last for at least 30 years. However, about 10% of the nearly 10,000 individual U-shaped tubes in the steam generators in one reactor are already showing excessive wear, and a steam generator in the other reactor suffered an unprecedented tube rupture, causing a reactor SCRAM, a release of radioactivity, and yet another extended shutdown. It could have been a lot worse: There could have been a cascading failure of the tubes, or the parts could have broken off and blocked valves or coolant flow through the reactor. Furthermore, the weakened tubes are liable to failure more easily than expected in the event of an earthquake. This is perhaps the most significant danger from the weakened tubes. Perhaps you feel this is "not your problem" but please remember that just as Americans are being harmed by Fukushima Daiichi's poisons, if San Onofre ever melts down, the people of Japan will be breathing our poisons too. And many of the parts in our reactors were made in Japan, just as many of the parts of your failed reactors were made here. We are all in this together, and we are all responsible for our future. There is no reason to risk these dangers. Cleaner alternatives exist, as many countries, including Japan, are beginning to recognize. The nuclear industry is based upon lies and must be stopped. It's main product is poison, which lasts for eons. It's byproduct is electricity, which is gone in an instant. Please do not buy the nuclear industry's assurances that burning the waste is safe. For the sake of all living things, these poisons must be isolated, not spread around! 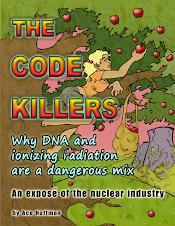 The writer is the author of THE CODE KILLERS, an expose of the nuclear industry, available for free download or online viewing at his web site: www.acehoffman.org. He notes that nearly 30 cities in Southern California are "sister cities" to cities in Japan, and these 30 cities contain approximately 1,000,000 inhabitants. Please think about where your radioactive ashes will land! On your brothers and sisters! Lecture note: The author will be speaking at the Joyce Beers Community Center, San Diego, California, USA at 7:00 pm Monday, February 20, 2012. PRESS RELEASE: Thank you, San Onofre Nuclear Generating Station -- again! Steam generators for Pressurized Water Reactors such as San Onofre are massive things: Huge towers filled with thousands -- or even tens of thousands -- of individual steel tubes. Inside these tubes flows -- very quickly -- very hot, very high pressure water. Outside the tubes, but still inside the steam generators (which are inside the containment domes, alongside the reactors themselves) water fills the lower portion of the steam generator, and steam bubbles up and fills the upper area, and then exits the steam generator (and the containment dome) to turn the turbines (located in another building nearby). The turbines generate the electricity, then the steam is condensed back into water, and returned to the steam generator to be boiled to steam again. Inside the tubes the extremely hot, highly pressurized water comes into direct contact with the zirconium-clad nuclear fuel rods in the reactor. Consequently, it is highly radioactive, mainly with short-lived noble gasses such as krypton and xenon, but also with various amounts of tritium (radioactive hydrogen). Also, there are lesser quantities of uranium and plutonium, which have escaped the fuel rods through microscopic (or larger...) cracks. In addition to the uranium and plutonium (thousands of times more harmful than the uranium) there are radioactive products of the fission process such as cesium, strontium, polonium, iodine and about a hundred other elements. Pound for pound, many of these are also thousands of times more toxic than uranium. The sudden rupture of one of the thousands of credit-card-thin metal tubes inside a steam generator is a very violent thing. On one side is extremely hot water that would just love to violently turn to steam, but is normally under pressure so it can't. The pressure differential is enormous. Cascading failures of the tubing in multiple steam generator tubes, leading to a burst or blocked cooling pipe or ruptured steam generator is just the latest nearly-realized potentially catastrophic problem for nuclear power plants everywhere -- and for San Onofre in particular, in densely-populated Southern California. And the word "catastrophic" is hardly an exaggeration. Such a failure can lead to a complete inability to cool the reactor, and a meltdown. Fukushima USA would be a disaster which would dwarf Katrina, 9-11, Pearl Harbor, or anything else America has ever experienced. It might even dwarf Fukushima itself. Did we almost lose Southern California earlier this week? They wouldn't tell us if we did, but it sounds like we came mighty close. On the other side of the country, Three Mile Island's steam generators, which were made by AREVA, are also full of problems, and that reactor is also shut down and "assessing the problem". La Salle also installed new AREVA steam generators recently and they're having problems as well. San Onofre's steam generators were made by Mitsubishi in Japan. Mitsubishi's steam generators are cracking unexpectedly early in other nuke plants -- it's a generic problem in the industry. But reportedly, San Onofre's problems are among the worst, if not THE worst "teething pains" anyone's ever seen in any nuclear steam generator anywhere! At San Onofre Unit II, about 10% of the tubes have 10% or greater wear after little over a year in operation -- about 1% have 20% wear or more! Weakened tubes make cascading accidents more likely. And they want to re-license this hunk of junk for ANOTHER 20 years? They want to restart it?!?! It's time to shut it down forever! Stop work, decommission San Onofre, move on to clean energy (including offshore wind farms right here off our coast). Now is a really good time: It will save us all a lot of money to do it now rather than later. Later might be way too late, and even if nothing goes catastrophically wrong, leaving the plant open means nuclear waste is piling up with nowhere to put it at the phenomenal rate of 500 pounds per day (when the reactors are both operating). The Nuclear Regulatory Commission just announced that the waste will probably be stored here for at least 250 to 300 years! The accidental release of even one day's production of fission products would be catastrophic. Every day we keep the plants operating, we increase the risk for our children, our children's children, and everyone else, for thousands of years. This latest incident -- which they refuse to call an accident -- caused a brief burst of radiation into the environment. If you happened to be driving by San Onofre when it happened, with your infant in the back seat, it might have been a very strong dose. No one knows what might have been released because the plant itself doesn't have very good information, and whatever data the plant has, they're not sharing. Thank you, San Onofre Nuclear Generation Station -- again! We appreciate yet-another wake-up call.